Founded in 2007, the Campus Rotaract Club of Davis (CRC Davis) is a service and business club on the campus of the University of California-Davis. CRC Davis’s goal is to mobilize students to do service to humanity, while improving their own leadership and professionals skills through workshops, committees, and events. CRC Davis currently has over 100 paid members, and meets every Tuesday at 7:10 PM in Olson 206 for the Spring 2019 quarter on the campus of the University of California-Davis. Members of the CRC Davis, or Rotaractors, serve both the local and international community through service events and charity fundraisers. CRC Davis is sponsored by the Noon Rotary Club of Davis, the Sunrise Rotary Club of Davis and the Sunset Rotary Club of Davis . Visitors and non-paid members are always welcomed at general meetings and our events! 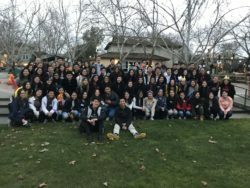 The Campus Rotaract Club of Davis was founded in October of 2007 by Mitty Chang, Paula Jean Fonacier, and Marcus Tang as an effort to bring the world of service above self to students at the University of California-Davis. These three founding members became the first set of Presidents of the club. They served from October 2007 to July 2008 as co-presidents. In May of 2008, it was decided that for the new Rotary year of July 2008 to July 2009, that there would only be one President to serve the club. Mitty Chang was elected among the officer corps to serve as president. The President-elect would then restructure the six-member officer corps into the 14-member Board of Directors that exist today. Board members for new terms are now chosen by the President-elect and Vice President-elect, with approval of the Board of Directors. The Board of Directors of the Rotary year of July 2008 to July 2009 made their decision and elected Louis Han and Kristin Dang as the new President-elect and Vice President-elect for the Rotary year of July 2009 to July 2010. As the new leaders of Rotaract, Louis Han and Kristin Dang elected the rest of the 14-member Board of Directors. With the new Board of Directors, Rotaract has grown stronger and more intricate in providing our members with professional guidance and having interactive activities that bring our members closer together. Since its inception in 2007, the Campus Rotaract Club of Davis has grown from a small 25 member student organization to a bustling 100 member organization.